So it may come as no surprise to anyone that has seen my doll collection that I tend to prefer buying ‘fixer-upper-dolls” instead of pristine, NRFB (never-removed-from-box) dolls. It’s the satisfaction of fixing something up. Well, I don’t have any before pictures of this Grannykins, so you’ll have to take my word for it. She was not so nice when she first arrived. She’s feeling much better now, thank you very much. She reminds me a bit of the Dowager Countess from Downton Abbey…. She’s pretty cool, don’t you think? 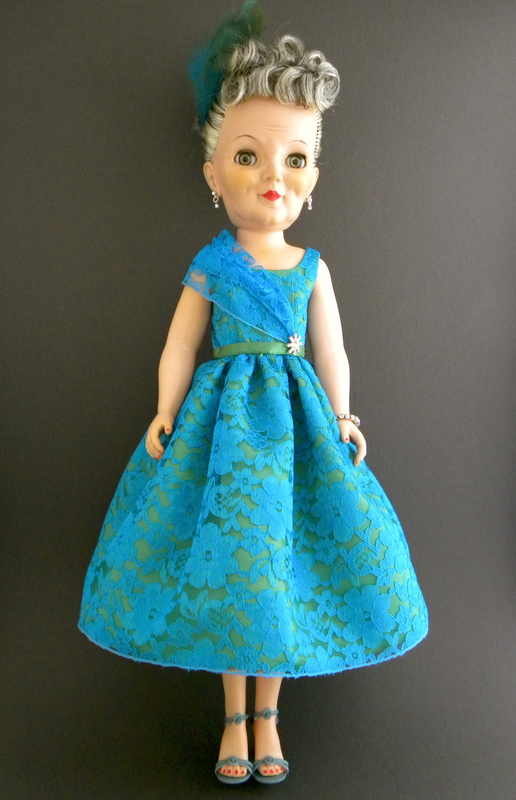 At about 20 inches, she’s a perfect chaperone for a host of other vintage high-heeled fashion dolls. That’s a cool doll! She does look very sophisticated, you did a great job on her hair too. I love Downton, too! It’s the best! Hello Matilda I have a grannykins-a royaldoll on the neck. She needs your special touch to bring her back to her formal glory. I can send pictures if you are interested in buying her. She has original earrings eyeglass marked made in France not sure if those were orginal but they were in her when I bought her. Long pink formal dress, petticoat, net hoop, stockings, lucite glitter heels lace up, garder for thigh, net for hair most in good shape some fair shape. Thank you for your kind offer. I really appreciate it! I have quite a few grannys over here. If I bring in one more they might stage a revolt! You could try giving her hair a rinse with fabric softener (good old fashioned Downy), then comb it out and let it air dry. Sometimes there isn’t much you can do when the hair is brittle, but being gentle and using fabric softener might work for you. Good luck! 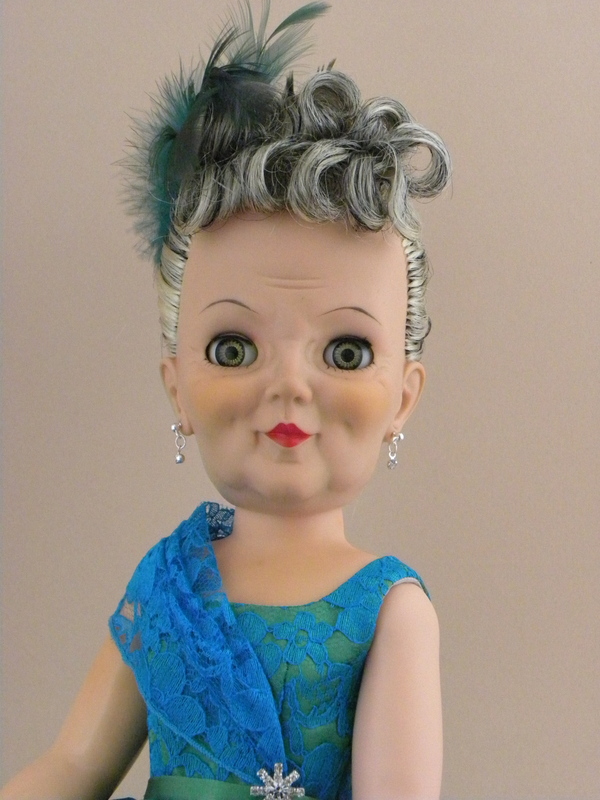 I have this grannykin doll!! I have always been curious. Contact me if you’d like pictures. I have a Grannykins named Karen (I believe) that was my Grandmothers. Her shoes and hose have fallen apart. I stupidly took her champagne colored gown apart to make new outfits and can’t get it right now. Where can I get original replacement outfits? She could probably fit many of the other fashion doll clothes for dolls of that height from that time period. I’d start looking on eBay if you want an outfit ready to go, or check out the vintage patterns if you’d like to make her outfits yourself. Good luck! Hi Alice, thank you for stopping by here. I think that eBay is probably a good place to look for realistic prices for most dolls like this. That said, Grannykins doesn’t show up a lot, so I wasn’t able to find any completed listings with a sale price for one. Grannykins is a really unique doll and it takes just the right buyer to appreciate her. I just saw one on that auction site and she has a Buy It Now price of $66.50. Whether or not someone purchases her for that price is another story. In any event, I hope this helps you. Best of luck!